Let’s continue with the GF Herald article from last Sunday suggesting a housing price problem in Grand Forks. There were a few prices gathered for a few cities. The selection of cities is questionable. Fargo and Minneapolis I understand and they make sense. Denver and Chicago? These are much larger cities and well outside the immediate region. Hey, let’s add the Hong Kong market! I hear Singapore has a booming housing market. There are totally different dynamics in these markets than in Grand Forks, so bringing them up is somewhat irrelevant. Let’s get right to the point. What is happening to the price trends in cities in North Dakota? This graph includes all three North Dakota MSAs and one thing is clear, they all seem to follow a similar pattern. This is important. While at times Grand Forks sees larger growth, and at times it is one of the other MSAs, the rough pattern is similar. So in this way Grand Forks is not special. That is, if there is a problem here, there are problems elsewhere, and that should be reported. Now what about that comparison to Chicago? This is silly. If housing is more affordable will people move from Grand Forks to Chicago. At the margin, maybe a few. Maybe. This would imply the ability to relocate your job as well. I am from Chicago and I find this unlikely. However, let’s take a look at the growth in prices between these cities. Oh look. The pattern is similar. 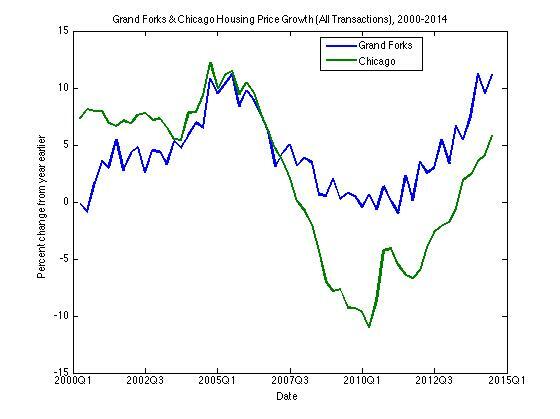 The Great Recession clearly had a bigger impact on housing prices in Chicago than Grand Forks, which is to be expected, so the growth performance was better in Grand Forks overall. Still, the rough experience in these two cities is the same, so there is real story there. This raises a bigger question. What about the trends in the nation as a whole? Good question. I have a graph for that. 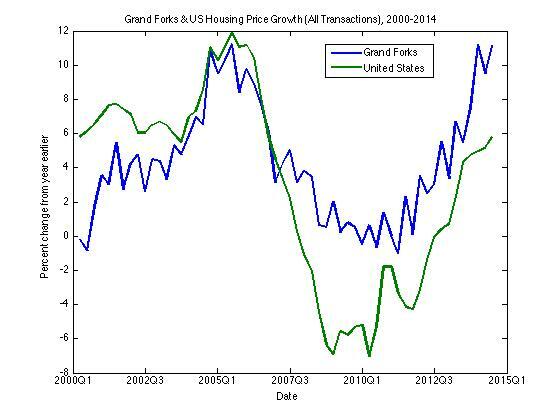 The growth of prices in Grand Forks is very similar to the pattern we observe in the nation as a whole. Once again, the dip in prices was clearly greater in the nation as a whole than in Grand Forks, but that is not surprising. It is really remarkable how similar the two graphs are. So the events in Grand Forks are similar to the pattern in the nation as a whole. The similarities are one of the reasons I suggest the efforts here are to start a broader discussion about inequality in Grand Forks and North Dakota in a Piketty fashion. 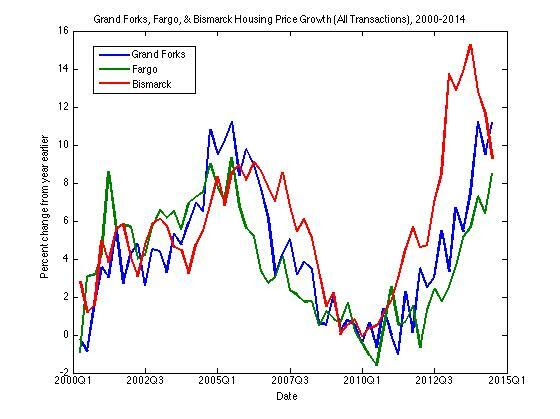 The problem is, so far I am seeing nothing exceptional about the price movements in Grand Forks compared to any of the other cities when you actually take a look at the data in a meaningful way. I know facts tend to get in the way of policy efforts of both the right and left, but jumping into this debate with inadequate information is just silly and risks making your unproven problem even worse.